Australia has not been in the blog focus for a while, but of course we have collected the data all the time. Last fall we thoroughly analyzed the news field in Australia for more condensed themes . This time we want to take a broader view on what has been happening in the last 7 months. First we will go through the recent developments in the News Boxes for desktop and afterwards we will go on to the AMP Carousels for mobile. We do have some extreme curves- so stay tuned. First up: Visibilty Analysis for Desktop Google News Boxes (Top Stories Boxes). There is a big change throughout the last 7 months in Australia’s top 3. Pictured are the top 5 most visible publishers for the desktop Google News Boxes in Australia for the last 7 months. In addition we will take the figures of the top 10 players into consideration. Let us start with our gold medalist: news.com.au. From September until November 2016 they had a visibility around 17 percent on third position, but their score grew strongly in the last 4 months with values over 20 percent. Their closest competitor is abc.net.au with a maximum score of 27.02 percent for the visibilty in the dektop News Boxes last September. While this is still very strong they have slowly been dropping down to their lowest score of 18.70 this month and are down to nearly the same level as number three smh.com.au. On fourth position we have theguardian.com with visibility scores of around 9-11 percent until December. While theguardian.com has an Australian edition, their most popular topics in Australia have been more international. Closing up to them throughout the last 2 months is theaustralian.com.au with a maximum of 7.39 in February. Other places in the top 10 take 2 Australian players (heraldsun.com.au; 9news.com.au), 2 British players (telegraph.co.uk; dailymail.co.uk) and one US-American player (yahoo.com). Next we are taking a closer look to a specific alement of the mobile SERP: the AMP Carousels. Obviously there are more news relevant elements in the mobile SERP (single-source carousels/Publisher carousels, organic ranks, text links…) but we focus for this analysis on the AMP carousels as they are getting more an more important (we will publish new data for the AMP percentag in the various elements soon) in the mobile SERP. Smh.com.au manages to stay ahead of the rest of the competition. We will look at Australia’s top 5 for the AMP carousels in the last 7 months. Clearly on top is smh.com.au with nearly 80 percent visibility in September and November. However, they struggle between December and February, reaching a low point of 45.76 in February. Luckily, they are back on their feet in March and up again to 66.75 points. Obviously it would be interesting to look deeper into these strong changes. Second place takes the player with the most interesting curve yet: 9news.com.au. While they reach scores over 45 percent from September to November their visibility is suddenly down to 0.12 percent in December. They can gain some of their former visibility back in 2017, but they are still only around 30 percent for February and March. The next three players are relatively close. 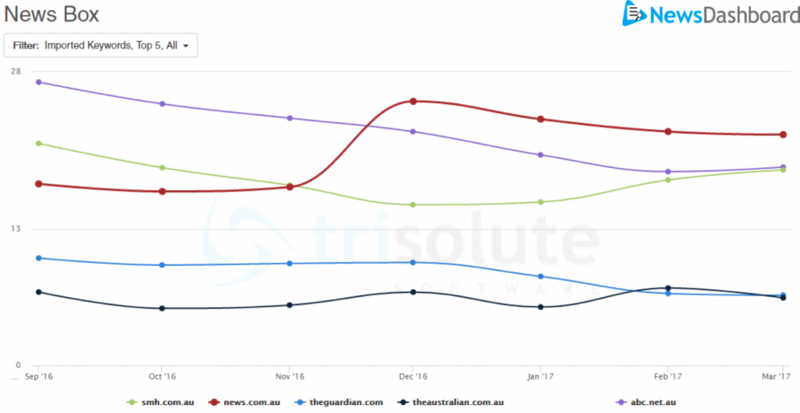 Third position is taken up by news.com.au with a maximum of 37.29 percent visbility in the AMP carousels in October. 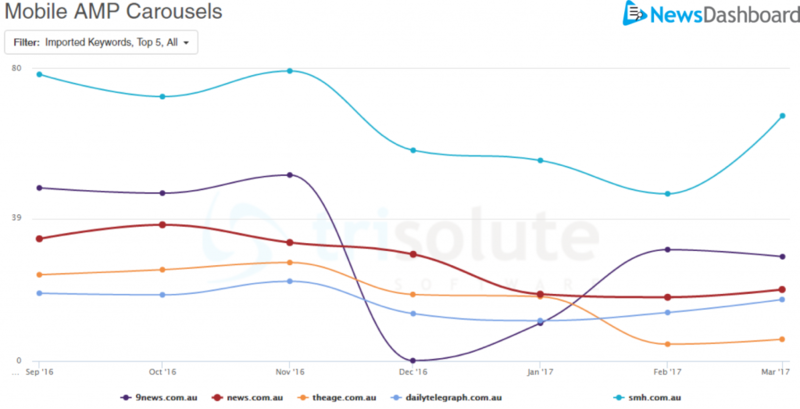 Theage.com.au takes up fourth position for the AMP carousels until January 2017. Afterwards, they are down to fifth place with a minimum of 4.62 percent in February 2017. Dailytelegraph.com.au is the last competitor making the top 5. They reach their highest score of 21.84 percent in November and their lowest score is 11.07 percent in January. All other players in the top 10 are only local Australian publishers. Smh.com.au and news.com.au are really strong for both mobile and desktop. While the desktop results are more diverse and international, we have a strong local competition in the (mobile) AMP Carousels. We will keep an eye on further developments in both SERPs.